As thinking, rational, yet feeling creatures, we often turn the table on the Gods. We make them into our image. They embody the traits and qualities that we fear, covet, or esteem. But like the Greek pantheon, this tends to be rather narrow. Only certain traits are represented in the deity. We have done the same for Beethoven, I’m afraid–put him so high on the pedestal by enshrining him in the halls of fate and struggle. He becomes everything we fear will control or destroy us. He heroically overcomes it all through his art, of course. This transformation places him atop our pantheon of the greatest composers. The Zeus of the classical music world. But, is it a fair assessment? 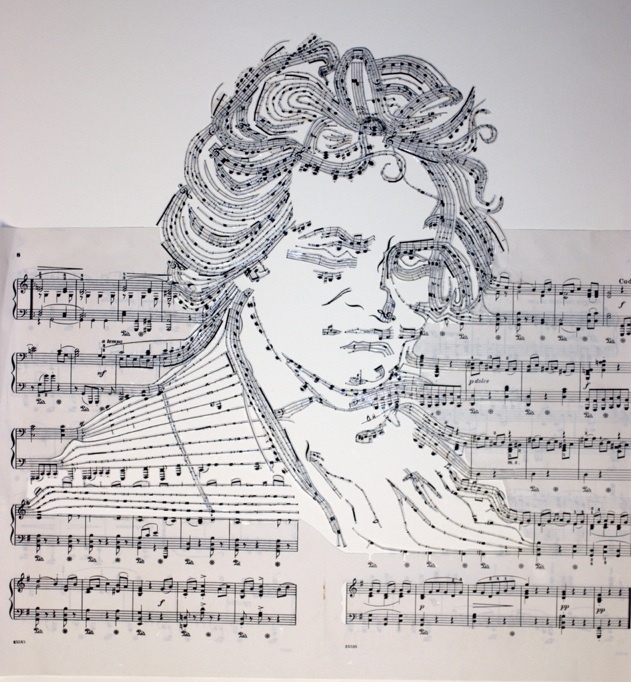 Let’s imagine Beethoven composing. There is a piano. There is an inkwell and a quill pen. As he scratches in the motives and melodies he is…smiling. Smiling? Yes. And perhaps giggling. This leads to fits of open chuckling. The master is laughing. But this is not the Beethoven we are accustomed to imagining, nor interpreting, and that leads to interesting questions. We say, “It’s BEETHOVEN after all! Thunderstorms; Fate; Shaking fists; Despair.” When there is joy, it is often related through energy, transformation, and mastery. But funny? Witty? Playful? Smiling? Rarely do we consider Beethoven in these lighter terms, so pervasive is the cultural image that we have invented. We have molded him and his music into something wonderful, yet tragic and struggling. Indeed some of his music is exactly that. I’ll posit that Beethoven must have been more than that, though. Like us, he was human, and the human condition involves the entire gamut of emotion. Truly, his struggle defines much of his music and philosophy. It even launched the Romantic image of the quintessential composer. However, Beethoven, we must remember, was subject to the same basic human traits as the rest of us. These traits include humor. The include laughter. They include happiness. By 1811, Beethoven had been deaf for a number of years. But he was far from frail as he began this symphony. Although he suffered from illness while writing the symphony and struggled with writing the famous “Immortal Beloved” letter during this time, he still enjoyed a good meal. He still read with enthusiasm. He still had hopes and dreams. And, I’ll wager, he also found humor in life and music. We must remember that Beethoven was a student of, and held in high esteem for, the greatest musical punster of all time, Franz Joseph Haydn, whose music is full of musical surprises, jokes, and winks. Such is my preface to this week’s concert with the University of Utah Philharmonia. I’ve had a great time introducing the 7th Symphony to our fine student orchestra. And I hope we will communicate Beethoven’s sense of play. In our reading, Beethoven is never intended to be heavy handed. Beethoven is boisterous. Beethoven is clever. Beethoven is folksy. Save one repeated moment in the second movement, there is no deep sense of fate or impending doom, transformation for mankind, or struggle for meaning. To be sure, many conductors and performers have put that light on this work. Some versions of the first movement rhythms are heavy and pounding. Hopefully, ours will come across as boisterous and playful. While there are stodgy versions with pauses hidden with existential meaning, ours will be a wink and a nod to Papa Haydn. Rather than a dirge-like second movement, ours will be an exploration of texture and a nod to the past. We have found Bach, Haydn, Mozart and perhaps even religious chant embedded in our interpretation. The Scherzo is truly a joke. Form, key, and tempo all hint at a grand ruse. I can hear Beethoven smiling. The last movement is virtuosic, but it is also a peasant dance, full of stomps on the “wrong” beat. All of this hints at one thing, in my opinion. Beethoven, no matter the key, mood, or motive, is, in the final assessment, a master story teller. He takes us on a journey with more twists and turns than expected, all with a twinkle in his eye. The story he tells in the Seventh Symphony is not about fate or some heavenly future. Some days are just like that. Some days we are simply in a good mood. And Beethoven. See you at the concert! Libby Gardner Hall 7:30 p.m.